What type of award designs should we choose? How many awards should we have? Let’s take a deeper look into these questions. The short answer: it all depends on who is receiving the award. To be truly effective, employee awards must be symbolic and personal. 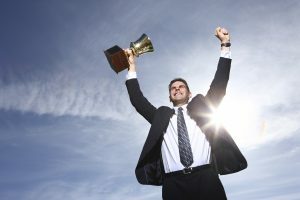 The reason that experts recommend giving a deserving employee a unique award (like a crystal obelisk or a star) is because the award acts as a reminder of their success and is visually striking enough to encourage them to display in their work space. The idea is that every time the recipient looks at the award they should be able to recall the emotions they had when they receive it. Our advice is to match the award to the achievement and the personal style of the recipient when possible. Think about what the all-star employee has done for the organization, then choose an award that embodies those qualities in its shape and size. Also consider the personal style of the recipient. If the recipient is trendy, contemporary, and up-to-date, choose an award that is has those characteristics. This will go a long way and will make the award even more valuable and significant. Of course, if you are choosing awards for a large program, this isn’t always possible. How many award designs should we have? You can have as many different designs as you like, but just make sure the size of the award matches the magnitude of the accomplishment. You wouldn’t want your gold-level recipient to have a smaller award than your silver-level recipient. Third place shouldn’t have a bigger award than second place. You can have three totally different designs for a gold, silver, and bronze-level award, as long as their sizes and quality are appropriate to each other. Your corporate culture should determine how much you spend on an award. Some companies may have more flexibility, while others may depend on an annual budget that’s controlled by people you’ve never even met! If you want to make a big impact, choose an award that will make a profound statement – and think of the award as an investment. Other times, it will make more sense to give a small number of inexpensive awards in order to reach more individuals. Every person who is rewarded at work may have a different experience but, if done right, all will walk away more engaged. It’s important that the award is also presented to the recipient in a thoughtful way (whether that is privately or in front of the entire company). The goal is that the employee knows that the company they work for cares about them, and hopefully, they care more about the company in return. Engaged employees are more productive and happy at work, which in turn drives retention and revenue. They provide better service, which leads to more satisfied customers and ultimately more sales. When it comes to awards, everybody wins! Need help with your year-end recognition awards? Contact us!